Navajo code talkers in the U. S. Marine Corps relayed orders in the Navajo language on a field radio in the South Pacific. Cipher machines, or machines that create coded messages, did not work well in the jungles of the Pacific Islands during World War II. However, the United States military needed coded messages to send secret information from the battle lines to air bases and other locations. Native Americans who spoke the Navajo language helped solve this problem. The Navajo “code talkers,” as they became known, used English code words that they translated into their language to send messages. The Japanese military could hear these coded messages, but they could not understand their meanings. The Navajo language was not well known. The Navajo code talkers served in some of the fiercest battles of the Pacific. They saved many lives and helped the United States and its allies win the war. However, the code talkers were never allowed to discuss their work with anyone. 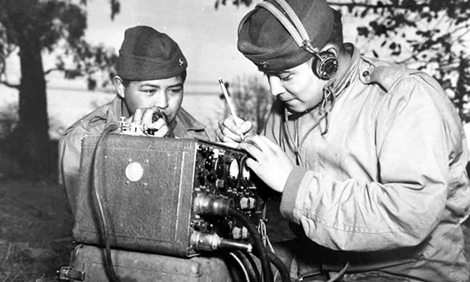 Most Americans did not know about the code talkers’ role in World War II until much later. For their bravery and service, President Ronald Reagan set aside a special day to honor the Navajo code talkers. In 1982, he declared August 14 to be National Navajo Code Talkers Day. What language was used in the code talkers' coded messages? Why was the Japanese military unable to understand the code talkers’ messages? Radio static made the messages hard to understand. The Navajo language was not well known. They were using the wrong decoder book. Gunfire made the messages hard to hear. In which year was August 14 declared to be National Navajo Code Talkers Day?